The first factor is clear: the CarFax report discloses the car as a former rental vehicle under the “Owner 1” information. Rental vehicles are often driven hard, and are rarely worth the same as non-rental vehicles in a fair market. A closer look, however, reveals the second–more important– factor: the rental company only owned the car from 03/30/2013 to 11/04/2013, or a little over 7 months. The average time-in-service for a rental vehicle is 13 months. This car is well short of that average. One of the primary reasons a rental company sells a car this soon after putting it in service is that the car presents a liability. Title history reports such as CarFax typically turn up major repair work processed by insurance companies, but most rental agencies are self-insured and the repairs done by captive body shops. The wreck will never show on the title, despite such information being one of the primary purpose and marketing points of ordering the title history. Only an inspection by a body shop revealed this car’s damage to its frame and sub-frame. The damage, as it turns out, is a safety issue and the car is not worth anything near fair market value of a non-wreck. The CarFax gives a false impression of quality here, and in many unreported wrecks. Beyond my friend getting ripped off (though I am working on fixing that for him), the quiz raises a broader issue. Title history companies have little incentive to find prior-wreck information when not branded on the title, nor do they adequately disclose such blind spots. Certainly, CarFax has a “CarFax Guarantee,” but it only covers situations where CarFax misses a title actually branded as prior wreck or other defect. When the defect is hidden from the title for some reasons, the title history provides a false comfort. A better car history model would be consumer facing and use the information in the title history indexed against known defects to provide alerts that the buyer may wish to consult with a professional about the value of the car. For example, a report could advise consumers that a rental agency sold the car before reaching the average in-service date and recommend the consumer consult a body shop. The service could even extend its reach by partnering with local body shops and providing recommendations or a platform for advertising. At redesignmobile, we see it as our mission to uncover holes in consumer service and work to fill them with solutions beneficial to consumers and the companies that serve them. While we are not currently engaged to redesign the title history market, we also see it as our mission to bring such issues to light in the hopes that we can kickstart a discussion as to how we can all rethink, rebuild and redesign our world. If you’d like to shine a light on other flaws in title history reports, or any consumer related matters, feel free to drop me a line at chuck at redesignmobile.com. I’m more than happy to listen. This leads to today’s question: Why doesn’t CarFax provide a simple score for each vehicle? Or put a red flag next to the big red flags? 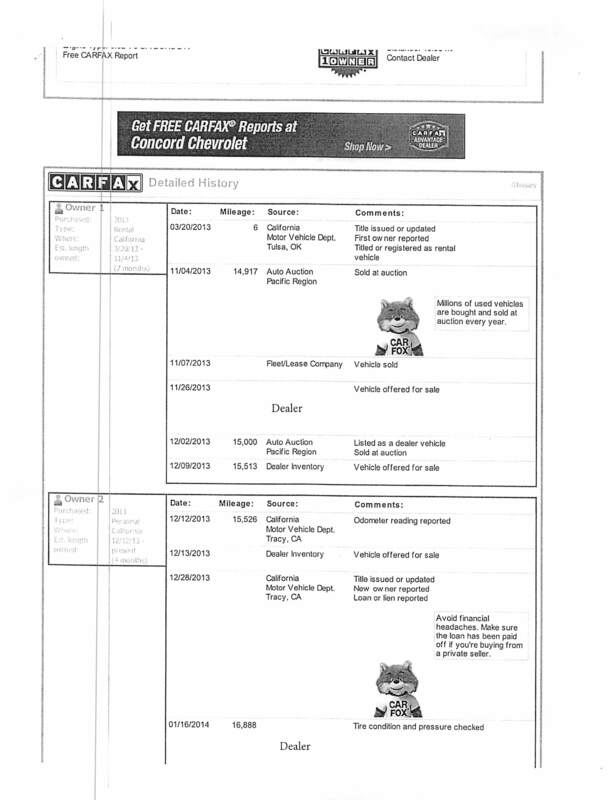 NOTE: The CarFax report also shows an odd title history under “Owner 1.” It appears that the car was sold at auction to a dealer and returned before landing with a second dealer who then sold it to Owner 2. It is impossible to tell from this report alone whether anything truly unusual happened, or whether the report is capturing an oddity in the transfer from the auction house to the dealer. In any event, in the context of the other information, this should be noted as another red flag and put the buyer on alert. Rocky got this one right. Previous Post redesignQuiz: Why was this used car purchase a bad buy?